Having failed to get help from local NGOs, the Roma party, the mass media or international organizations, for the first time in three years a Roma official employed by the Constanta prefecture called me and asked for my help. I arrived in Eforie Sud the next day. Earlier, on Friday, 27 September, forced evictions had been carried out by the local authorities in Eforie Sud, after the issue of a seven-day formal notice. Within a few hours, the lives of almost sixty Roma families of Turkish origin resident on Agricola Street, most of them since the early 90s, were shattered. Even though they didn’t own the land, over the past thirty years the city hall had “illegally” issued ID cards for most of the Roma living on Agricola Street, so they could cast their votes during the elections. More than fifty children where brutally dragged out into the street by riot police and abandoned to face extreme weather conditions with virtually no shelter. The families lost their homes and all their possessions, from furniture and clothes to documents and food. The pouring rain made it extremely difficult for the mothers to bake bread, the only foodstuff available, albeit in scarce quantities. As far as I could tell, the city hall was unable to justify the evictions as an emergency measure, as there had been no consultations and therefore no alternatives had been presented, including adequate temporary shelter; no children psychologists had been present during the evictions and the authorities carried them out in the middle of a code-orange weather alert for heavy rains. As a result of my appeal for aid, Save the Children mobilised their resources to send food and with the Red Cross they organised a camp of tents. After debriefing, Amnesty International also issued a public statement condemning the evacuations. 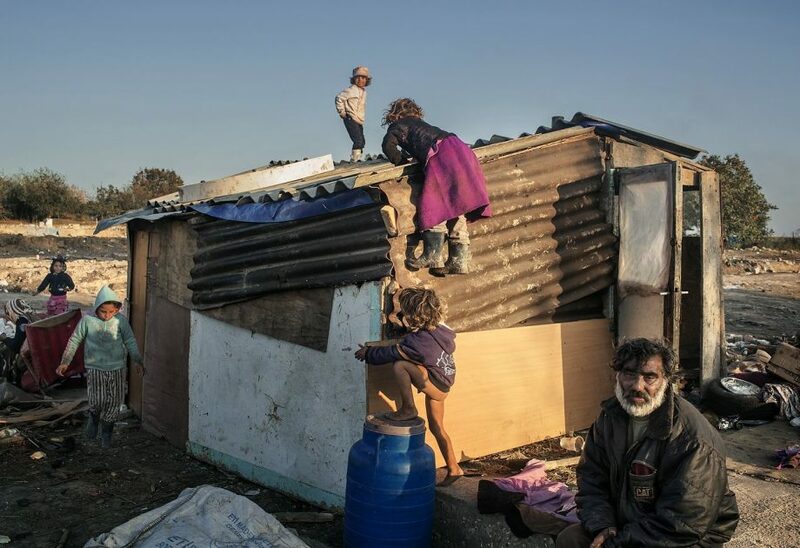 The forced evictions of around one hundred Roma people in Eforie Sud is yet another shameful example of how the Roma are treated in Romania, a country where we build shelters for stray dogs while children are left to sleep out in the open. Memet Ali (L), Memet Ebru, Iaia Leila and Iaia Geana, Roma of turkish origin seeking cover under an improvised shelter to protect from heavy rain, as seen in Eforie Sud, Romania, on September 29, 2013. 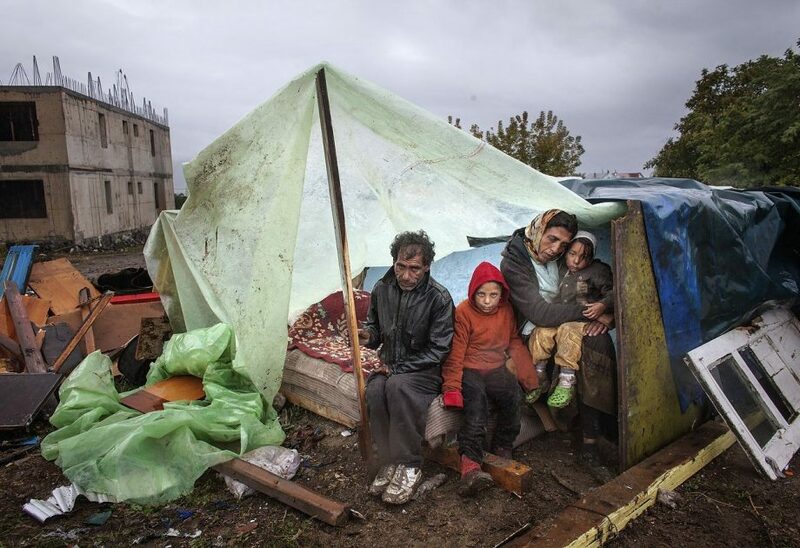 On Friday 27, 2013, local authorities in Eforie Sud, Romania, proceeded to forcibly evict more than 60 turkish Roma families, leaving almost 60 children, mostly under 10 with no shelter, facing extreme weather conditions and lack of food. 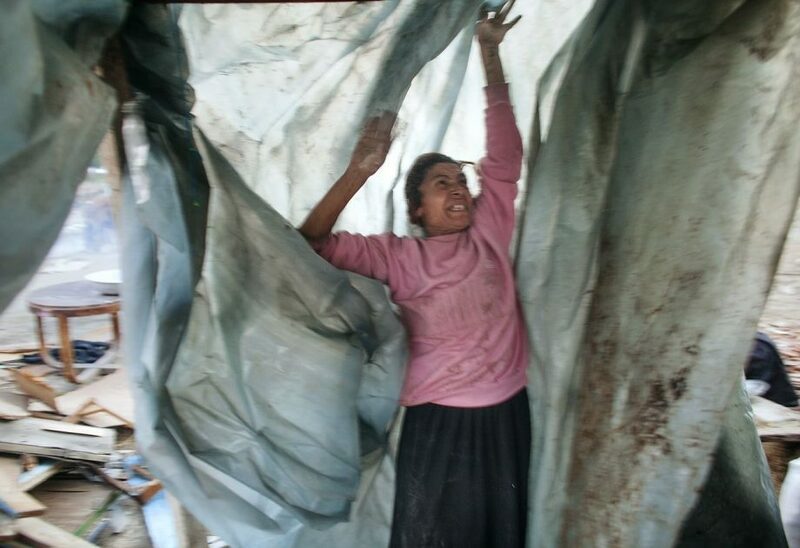 Iaia Leila trying to set a plastic foil over the roof over their improvised shelter after their home was demolished, as seen on Agricola Street in Eforie Sud on October 10, 2013. Regardless international pressure to stop such practices, local authorities threaten to forcibly evict the remaining Roma people, two weeks after the initial displacement. On Friday 27, 2013, local authorities in Eforie Sud proceeded to forcibly evict more than 100 turkish Roma people, leaving almost 60 children, mostly under 10 with no shelter, facing extreme weather conditions and lack of food. Roma kids climbing on the top of their improvised shelter few moments before it was demolished for the second time, as seen on Agricola Street in Eforie Sud on October 11, 2013. Regardless international pressure to stop such practices, local authorities continue to forcibly evict the remaining Roma people, two weeks after the initial displacement. On Friday 27, 2013, local authorities in Eforie Sud proceeded to forcibly evict more than 100 turkish Roma people, leaving almost 60 children, mostly under 10 with no shelter, facing extreme weather conditions and lack of food.